A fifteenth-century Gothic church. The exterior is very sober, contrary to the interior, which is overloaded with baroque art works. The explanation for this contrast lies in the turbulent history of the church during the religious turmoil in the second half of the sixteenth century. First the church was pillaged, then it was used as barracks and stabling. In the following centuries that restless history was erased. 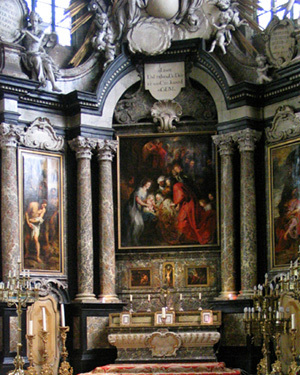 Artists from Antwerp and Mechelen made plenty of works by commission: the triptych by Rubens, wood carvings by Theodoor Verhaegen (the pulpit and church wardens’ benches to the left and right of the nave) and by Pieter Valckx (the organ-case and the overseers’ benches at the back).